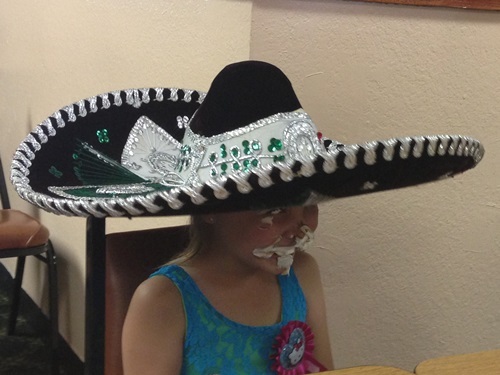 The Mexican restaurant in town, like most small town Mexican restaurants I’ve been to, makes it a practice to, upon learning of a diner’s birthday, slap a sombrero on the patron’s head, sing them a tune in Spanish and present them with sopapillas. At our joint they like to smear whipped cream in the face of the birthday girl/boy/woman/man and then take their picture for the wall of fame (shame?). Thing 2 has requested this treatment for her last several birthdays and we have obliged. Thing 2 is now six years old and she is such a fun little girl. She is a hard-headed fashionista. She is a tender-hearted caretaker. She is way too clever for her own good and she knows just enough curse words to laugh when she hears me say one but has the good sense to not unleash many of her own. I think she only knows one of George Carlin’s Infamous Seven. Hot Mama fears that Thing 2 will be our hard-partying teenage rebel. She is the most social of social butterflies. But while at home we see a definite disrespect for authority, her teacher had glowing reports of her exemplary behavior. So there may be hope yet. We always try to give each of our children equal love and attention and try to encourage whatever interests they may have. As the kids get older this gets more difficult. This year Thing 2 played soccer. She had team pictures one evening and it was my job to get her there. Hot Mama was at her dance studio with Thing 1. Thing 3 was at home with our nanny, Sissy K. Time slipped away and by the time I realized what had happened I got Thing 2 to the field just in time for her to get her picture taken, but too late to be in the team picture since most of the team members had left after waiting around for half an hour. When we got home, she got out of my car and with tears welling up said, “now when I look at my team’s picture I won’t be in it.” I felt like the worst parent in the world, worried I had ruined her life. But those pictures came in the other day and she really hasn’t mentioned it so maybe life will go on. From the looks of the smile under the whipped cream, at least today is a pretty sweet day.